I am delighted to have discovered Jane Jacobs’s The Death and Life of Great American Cities. I remember reading her obituary in The Guardian some years ago and thinking how inspiring she was. According to The New York Times, although written in 1961 the book is ‘perhaps the most influential single work in the history of town planning.’ As well as writing the book, it seems that Jacobs galvanised local people to stop the destruction of Washington Square in New York by urban planners. I wonder what she would have made of the present day Chinese approach to planning, especially the way that new districts of cities seem to be built on the American model, without much reference to the human scale – tall, imposing glass towers, wide boulevards, huge, windy public squares etc, etc. Some of Ningbo’s parks seem to fit the Jacobs standard and indeed attract different groups of people, although I don’t know yet whether they are used all day, every day. Last Sunday we cycled to one that was new for us – designed specifically for children and families and next to ‘Ocean World’. It is located north-east of our compound in an older and less affluent part of town, if the surrounding slightly down-at-heel, medium height apartment blocks are anything to go by. The park is laid out on a similar plan to smart Yinzhou park on the edge of the new business district, but doesn’t attract the same ‘new rich’. No picnic tents or wedding parties having their photographs taken, partly because of a dearth of scenic spots. In Yinzhou notices were in characters with English translations – very sophisticated. Here there were simple pictures. 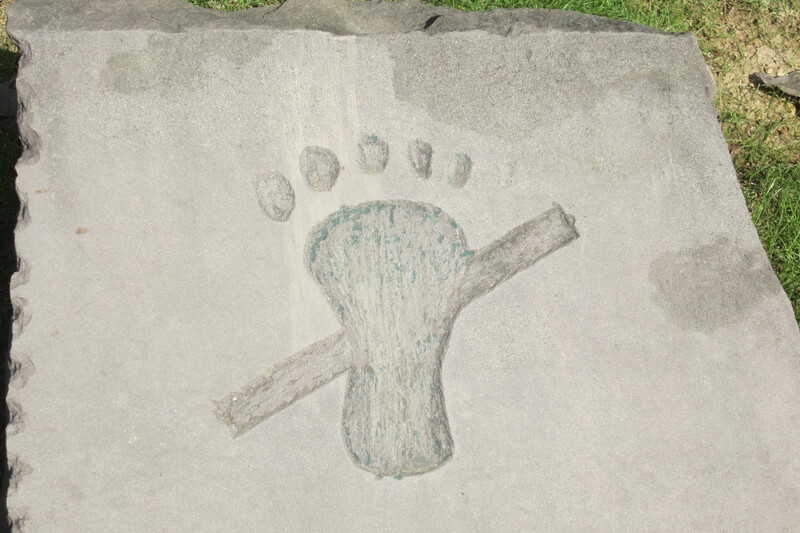 A large foot with a line through it: don’t step on the grass (it didn’t have much effect). There is a lake, but when we looked closely we realised that the boats for hire were all in the shape of military hardware. 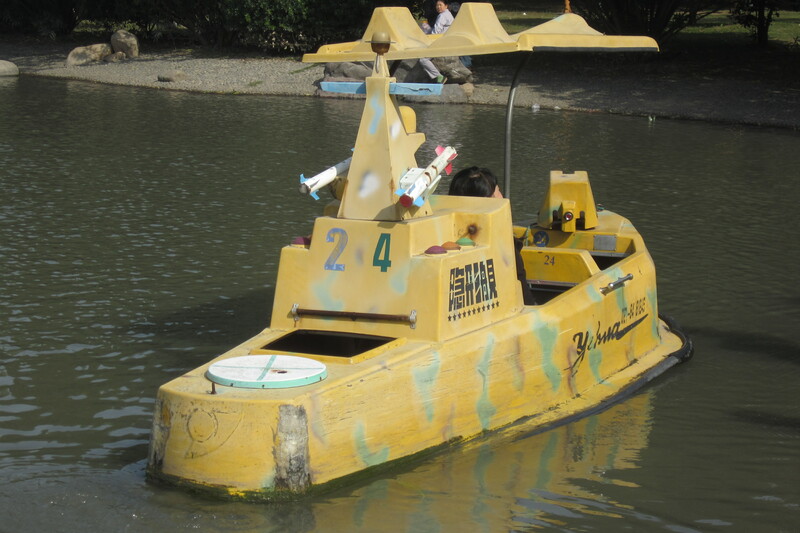 You can paddle around in a miniature submarine, gunboat or aircraft carrier. A machine gun is placed in the bows, so that you can take handy pot shots at other mariners. Buoys are actually mines and they spout water if you bang into them. The park was full of rides and these too had a military theme – lots of military vehicles and guns. To our amusement one ride was a fleet of US jeeps all with a little Stars and Stripes pennant! To me the park summed up the Chinese preference for boy children – every amusement was for little boys, although that is not to say that a few girls and mums weren’t enjoying shooting the water pistols. It also seemed somewhat ironic in the light of current CCP rhetoric about creating a harmonious society and promoting ‘peaceful China’. Just yesterday we spent a class discussing the meaning of ‘the New Confucianism’. I wonder what the incognito inspectors for National Civilising Cities made of it. Next on the list is a visit to a park on the west side of the city. My Ningbo city map tells me that it has an activity centre for the old and a bonsai garden. I think I might be happier there – for many reasons! From about 8 am on a Saturday morning – sometimes earlier – we are frequently woken by the sound of exploding fire crackers. This continues throughout the day. The fireworks come in two sizes: long, thin red strips that are rolled out on the ground and give a series of short, sharp flashes; and cylinders which send up a number of rocket-like blooms. The fireworks are set off as near as possible to an apartment block entrance and herald the exit or entrance of the bride or bridegroom. Limousines are parked nearby (sometimes alarmingly close to the fireworks – whole buildings have burned down in China due to fireworks), bedecked with red, pink and orange flowers. The doorway to the flats is decorated with an archway of flowers and tuile netting and sometimes pink and purple balloons are entwined across the pathway. Fireworks are endemic in China, although no one seems to quite know what they are for any more. One of our teachers suggested that they just make people feel good, and also mentioned that government attempts to ban them had had to be rescinded; people just couldn’t live without them. Although the fireworks are quintessentially Chinese, Ningbo weddings have taken on many characteristics of western rites. The last time I saw a bridegroom, when rubbernecking from our balcony window, I noticed that he was dressed in a costume that seemed to be a combination of a cheesy musical (The Merry Widow, White Horse Inn?) and Moss Bros. Red is the Chinese colour of good fortune and in the many wedding dress shops in the big cities, you can still buy red gowns, but most of the brides I have seen are dressed in elaborate white outfits, in western style. This is perhaps surprising as white is associated with mourning in Buddhism and a significant number of people in China still profess to Buddhist beliefs. However, it is arguably not at all surprising given the aspiration of the ‘new rich’ or middle strata, as they are called in Chinese official documents, to express their wealth through western-style consumption, from luxury cars to private education. 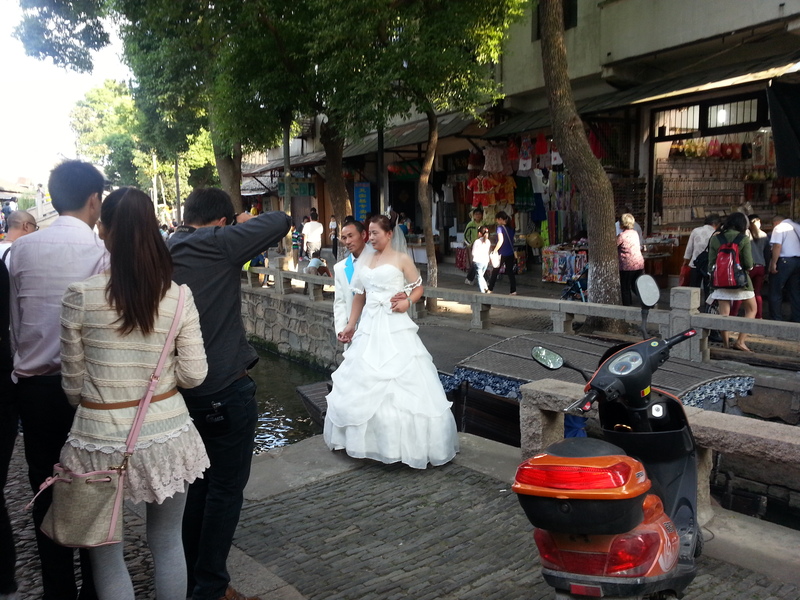 On a sunny Sunday afternoon the newest park in the south part of Ningbo (Yingzhou District, where the university is located) is teeming with bridal parties posing for photographs. These comprise the bride and groom, along with a set of bridesmaids in matching pastel outfits, usually teetering on very, very high heels. The photographer, dresser and other assistants carrying props are in attendance. Floral displays and rocky niches have been designed to aid the photographer. 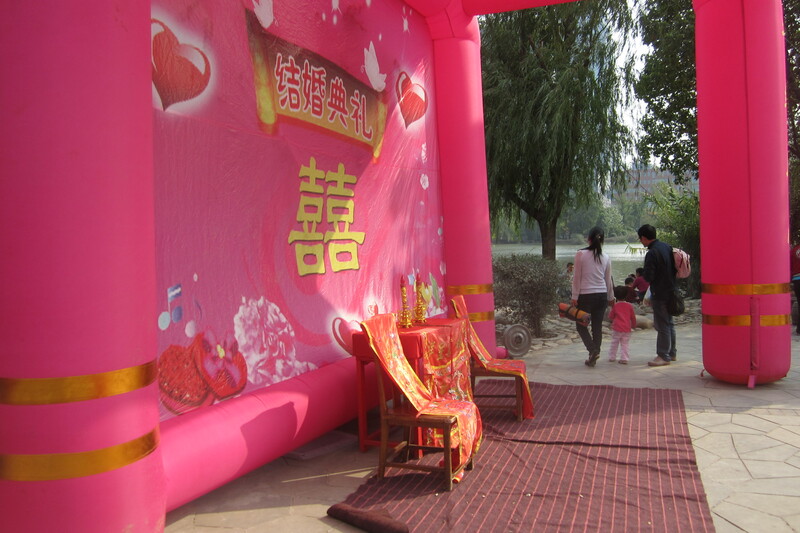 Inflatable, pink backdrops have been installed in scenic spots by the lake, where the happy couple can sit for more photos on ‘thrones’ under the double character for happiness xi – 喜喜 . The photos will be shown in slide shows at the wedding receptions, which probably take place on a different day. Another western custom that appeals to the ‘new rich’ is Hallow’een. To my surprise, a few weeks ago I stood beside a mother and daughter at the supermarket checkout who were buying the whole Hallow’een paraphernalia – witch’s hat, devil’s trident, plastic orange pumpkin etc. It turned out that Hallow’een was particularly popular with the Chinese students on campus, who made huge efforts to find fancy dress costumes, from pandas to Mickey Mouse. Apart from just a sense of doing something western, it’s difficult to imagine the appeal – other than the fun of dressing up. What could Hallow’een actually mean to a young Chinese person? About two weeks ago, a large artificial, fully decorated Christmas tree appeared outside Metro supermarket. Inside, several displays had been turned over to tree decorations, tinsel and glitter. Zara Home has just opened in our local mall and we explored it on Saturday. The central display was a table laid for Christmas dinner, complete with miniature Christmas trees, baubles and candles. There are huge numbers of Christians in China – estimates are between 40 and 140 million, although no one knows the true numbers. However, I doubt if this explains the marketing strategies of the stores and supermarkets here. In reality this is surely just another sign of globalisation, symbolic of the triumph of western-style consumerism in the new China. Incidentally, stores such as Zara have very few Chinese customers actually purchasing anything, as the prices are so exorbitant. The ‘new rich’ know this, and travel to Europe to do their shopping. This morning when I looked out of my kitchen window, the view beyond the first few tower blocks was shrouded in thick mist; pollution hung heavy in the air. Yesterday a colleague had questioned our cavalier attitude towards cycling to and from the university without face masks to combat the fumes. Today she sent us the app for pollution levels in the city. This links to a website that monitors the air quality of cities across China – http://www.aqicn.org . The reading for Ningbo this morning was 250 – Very Unhealthy. We decided that perhaps, after all, we should go to Decathlon at the weekend and invest in some masks, although I think that the curiosity, not to say ridicule, we might evince on our route may make us regret our decision. Reporting on air quality is one of a number of requirements for cities that aspire to be accredited as a National Civilised City (see http://www.thechinastory.org/yearbooks/yearbook-2013/chapter-5-building-civilised-cities/ for more details). Ningbo has twice met the requirements (renewable every three or four years) in the nine categories. The evaluation to ensure that a city meets the standards is carried out by incognito inspectors from the City Investigation Team of the National Bureau of Statistics. The local Spiritual Civilisation Office prepares a city for the inspection. The inspectors check the public infrastructure as well as the behaviour of the public – so they try taxis and buses, but also note how many people give up their seat to the elderly or pregnant women. Part of my career has been spent devising criteria for evaluation and methods for checking standards, so the whole process of the National Civilised City is rather interesting to me. However, I can’t help thinking that assessing a city of over 6 million people for its level of Civilisation is a whole different ball game from anything I’ve ever done in arts education. Still, being one of those secret inspectors might be rather fun. Anyway, despite having achieved the standard for reporting air quality, the pollution is certainly still here in Ningbo, although, as yet, nothing compared to Beijing, Shanghai or Xi’an. This is but one example of the credibility gap between what is said and what actually happens. For example, to be a Civilised City, at least 8% of the population has to take part in voluntary activity, and 90% need to be aware of voluntary opportunities. I realise that this explains the pleasant, but hopelessly ineffective volunteers flapping little yellow flags at intersections in the mornings attempting to stop e-bikers going over red lights. Presumably, these people have upped the volunteer quota for the local authority’s figures. Happily, as we cycle into the university’s green campus, the air quality improves massively, and in fairness to Ningbo’s government, half of our journey is alongside an extensive park which also helps to combat the pollution from traffic. Recently, bright orange Boris Bike hire stations have appeared beside the park, presumably to encourage cycling. No motor bikes are allowed in the city and buses run on LPG. I find that another credibility gap exists in terms of the idea of Chinese culture that is promoted in my Beijing University language text book and what people actually do and enjoy. I’ve just completed a chapter in which three students explain that their favourite hobbies are Chinese chess, calligraphy and taiqi. When I showed this to my private language teacher she couldn’t stop laughing. She finds all three utterly boring and believes that only older people do them. Of course, she says, young people here really like surfing the internet, chatting on social media, going to karaoke bars, listening to music and watching films, although the CCP only allows 20 foreign films a year to be distributed in China in an attempt to support the Chinese film industry. One of my seminar tasks for this week is to discuss the global spread of contemporary Chinese culture through its well-funded media outlets. The last leader, Hu Jintao, believed that one of the west’s strategic plots was to flood China with western popular culture, and that China should combat this with her own strong culture. I think he’s probably right about the ubiquity of western culture – especially its Hollywood and Disneyland derivatives and its fast food – but at the moment, I can’t see that a diet of chess, calligraphy and taiqi, along with English language newspapers, films and CCTV programmes constrained by the Party line are going to offer effective competition.